“[U.S. President Donald] Trump’s move is important in that it teaches a lesson to Arab leaders: The longer you wait to make peace with Israel, the less you’re going to get,” said David Weinberg, vice president of the Jerusalem Institute for Strategy and Security. 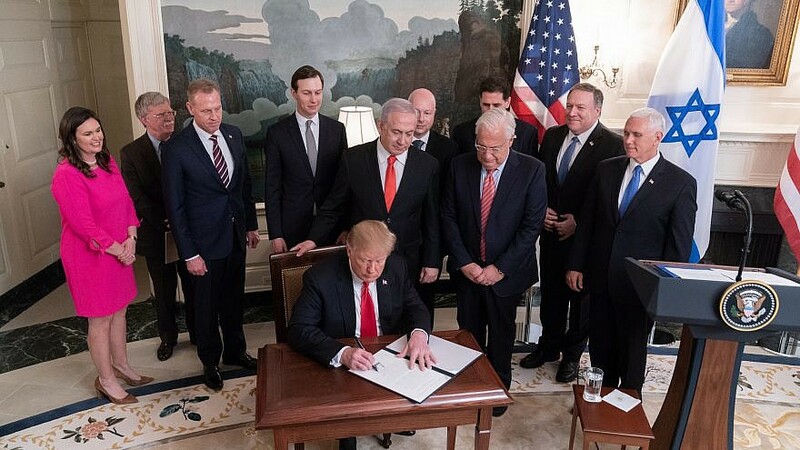 (March 26, 2019 / JNS) The formal recognition of Israel’s sovereignty in the Golan Heights by the United States could not have come on a more sobering day for Israelis. As rockets were being launched deep into the central Israel by the terror group Hamas in Gaza, the importance of the Golan Heights for Israel’s security was on full display. In his remarks at the formal signing of the presidential proclamation at the White House, Israeli Prime Minister Benjamin Netanyahu told U.S. President Donald Trump that the region was “invaluable” to Israel’s defense. “Your proclamation comes at a time when the Golan is more important than ever for our security, when Iran is trying to establish bases in Syria to strike at Israel,” said Netanyahu. A main argument among Israel’s detractors is that such recognition sets a bad precedent and will encourage other countries to capture and annex territory that is not theirs.